(Nanowerk News) Many animals, including birds, beetles, fish and butterflies, get their beautiful colors not only from pigments, but also from nano-scale structures that manipulate light. Now, such natural wonders have inspired Hong Yee Low and colleagues at the Institute of Materials Research and Engineering of A*STAR, Singapore ("Mimicking Domino-Like Photonic Nanostructures on Butterfly Wings), to make polymer structures similar to butterfly wings. Their structures produce optical effects that could prove useful in various electronic devices. 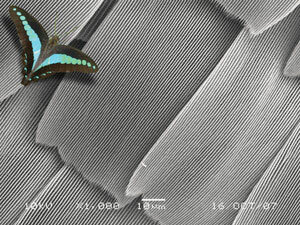 The surfaces of butterfly wings, for example, are made of long and thin parallel hair-like structures just 150 nanometers thick, separated by air spaces (Fig. 1). The fibers and air have different refractive effects on light striking the wings, causing interference and producing bright iridescence. “The butterfly wing structure is actually very challenging to mimic,” says Low, explaining that previous approaches, though quite successful, have required expensive equipment and time-consuming deposition methods. To address this problem, she and her co-workers took a new approach based on a simple and inexpensive technique called nano-imprint lithography. First, the researchers fabricated a silicon-oxide mold containing evenly spaced nanometer-sized trenches. They then heated and softened a polymer before pressing it onto the mold. Finally, they pulled the polymer off the mold at an angle to produce hair-like pillars on the polymer surface. The pillars, each just 200 nanometers in diameter and around 1.2 micrometers long, resemble a collapsed array of dominoes. Low and co-workers observed either rainbow patterns or single colors on their polymer surface, depending on the angle of incident light. This is because the collapsed pillars are parallel, creating ridge lines that look like a diffraction grating when viewed from one direction, but resemble a multilayered reflective surface when viewed from another direction. Eventually, the researchers hope they will be able to fine tune the structure of their butterfly surfaces and use different materials to produce a variety of optical properties. Low thinks the finished products could have some interesting applications.